Performer Juha Sääski. Photo © Aliisa Hautaviita. This presentation is divided into eight parts, and it will end with a small performance(2). In the first part, I present briefly the implications of this dramaturgical device defined as the play within the play. In the second part, I discuss my understanding of Luigi Pirandello’s work in relation to the play within the play. In the third part I start developing my personal reading of this device, which stresses the notion of disruption. In the fourth part, the interpretation of the play within the play progresses towards a philosophical reading of it, where I suggest that the play within the play creates its own frame contextualizing its own medium. In the fifth part, I depart from the strict text analysis, which this device is usually subjected to, and suggest that the contemporary shift of it is to play with the play. The seventh part is a small performance, which is an excerpt from my second practical work, The Invisible Stage(3). I will perform this extract with the help of the actor Juha Sääski. It can be awkward to insert a performance into the academic context. But I do think that there is a point in it, which should highlight the connection and exchange between theory and practice, as it has happened in my research. And the last part concludes this defense. This artistic research analyses a specific dramaturgical phenomenon, defined as “the play within the play”, which introduces a second story (or second play) inside the main drama. A theatrical event, or a show already displays a level of representation(4) in which the performers (or the fictional characters) are evolving in front of (or with) the audience. The implicit question then is: what happens when a playwright introduces a second level of representation? And then what happens when, within a play, some actors start performing for other actors? I realized that the play within a play is a complex phenomenon, which unravels fundamental aspects not only of the written drama but as well of the theatre event itself. Usually the play within the play is perceived as a device addressing issues of representation and introducing a meta-theatrical discourse. The most notorious example is Hamlet, in which the staging of the inside play, The Murder of Gonzago, permits to the prince to digress on the nature of representation. However, in my research, I tried to develop a different reading of the play within the play, which explores a political interpretation of this device and suggests that the play within the play can be a tool that intrudes into (or interrupts) the authoritarian discourse from within the authoritarian discourse. In fact, to go back again to Hamlet, the only way for the prince to challenge the King, is to put up a show. Hamlet cannot confront directly Claudius (the authority of the King) but uses the play within the play to do so. Therefore, as I conclude in my thesis, it is a means that disrupts playfully power from within. As I said previously, the play within the play commonly is perceived as a device embedded in the notion of repetition of the “representation”. What I mean by the notion of “representation” is that not only does the theatre event display a representation on the stage, but everyday life is also subjugated to its own “representation”. In my research, I refer to the theatre plays of the Italian playwright Luigi Pirandello(5), who explored intensively the issue of “representing a role”. In fact, one of the main features of his work is the examination of the contrast between the actor and the fictional character. The actor-character dichotomy is usually removed from “traditional” plays in order to focus solely on the fictional aspect. In a traditional play the actor’s individuality must disappear behind the fictional character. Pirandello instead unveiled this contrast and displayed it on stage. However, Pirandello’s concern was not related to the mere theatre event but he wanted to show that humans are constantly negotiating their own “representation”. At any moment, whenever I cross a threshold, whenever I enter a new community, I endorse a new role, or a new representation of myself, I also become a new character of myself, showing a new facet of myself. Usually, fiction and reality are considered two distinct entities, which are kept at distance. Pirandello in his theatre and in his use of the play within the play shows instead how the fictional world and the real world are superimposed in the everyday life. How fiction and reality are finding their convergence in the identity of a person. In this modality the play within the play is the blatant exposure of this phenomenon. Through the repetition of the representation (meaning through the display of an inside story) the tension between fictional character and reality is unmasked. For Pirandello, the identity is not something pre-given, fixed, immovable, but instead it depends on the situation, on the perception of others; for him it is the community, which defines what we are. The best example demonstrating this last idea is his play: So it is (Cosi è, 1917), which presents a confrontation between a husband and his mother in law who both pretend to be crazy. However, both assert that they are not crazy but obliged to perform madness because of the other one, and so both claim that the “true” mad person is the other one. The play ends surprisingly by offering no resolution (or truth about who is really crazy and who not), for it depends on the way you want to perceive it. And this how Shakespeare, Pirandello, and other playwrights, like Brecht or Yasmina Reza, have used the play within the play by adhering to this modality of repetition of theatricality and/or theatricalization of reality. The other modality of the play within the play that I intend to propose entails different implications for the introduction of an inside play, which is linked to the notions of resistance and disruption. A traditional drama, because it tells a self-enclosed story, has clear limits. And referring to the traditional Aristotelian understanding of the plot, it is the ending, the “closure” of the story, that provides the possibility to extract a meaning. In other words: the limits offer the meaning to the drama. We could infer therefore that the play has two limits: one defined by the story (which is related to time) and one defined by the architecture of the stage (which is related to space). When an inside play is introduced, the limits of the first story are therefore contested. They are pushed further, and they are fragmented. The inside play becomes an element of disturbance and disruption contesting the main story. Instead of it being a comment offering a new perception of the main story, it turns out to be an attempt to escape, to flee forwards from the structure of the main story: it can therefore be considered as an act of emancipation in regard to the limits imposed by the main story. This act of freedom, this “break” is a violent act interrupting, cracking the linearity of the main story. But in its attempt to flee, to break, in its wish to establish an alternative “narrative” to the first one (the dominant one, the one that frames the event) the “second” play cannot reach its goal (which is the completion of the story that, as mentioned above, provides the meaning of the story), because the focus is not directed towards the accomplishment of the second narrative but onto the characters witnessing the emergence of the second narrative. For in Hamlet, when the inside play, the Murder of Gonzago is performed, the attention is not directed towards the actors performing the inside show, but towards Claudius who is watching the show. This late note brings up the following problem: is the inside play not meant to finish? Is this inside story not meant to find its own meaning? Is it a story meant to fail? Could we even say that actually the play within the play contains its own failure? But the failure is not a failure. It is a failure in the context of “ending a story”, of permitting the plot to happen. It is in this case a chance: a bubble, a wedge cracking the dominant discourse. To go back to the Murder of Gonzago, Hamlet as I already mentioned earlier, through the staging of the inside play, manages to counteract Claudius’s authority. It is a moment of freedom. Therefore the play within the play can be understood also as a disruption pointing out what theatre has left out. In this model, the term ”disruption” is linked to the notion of disorder and break or split. The term disruption needs to be understood as interrupting the progress of something. This connects to the idea of ”suspension” rather than destruction or invasion. In this sense, disruption becomes a “bubble” within the system. 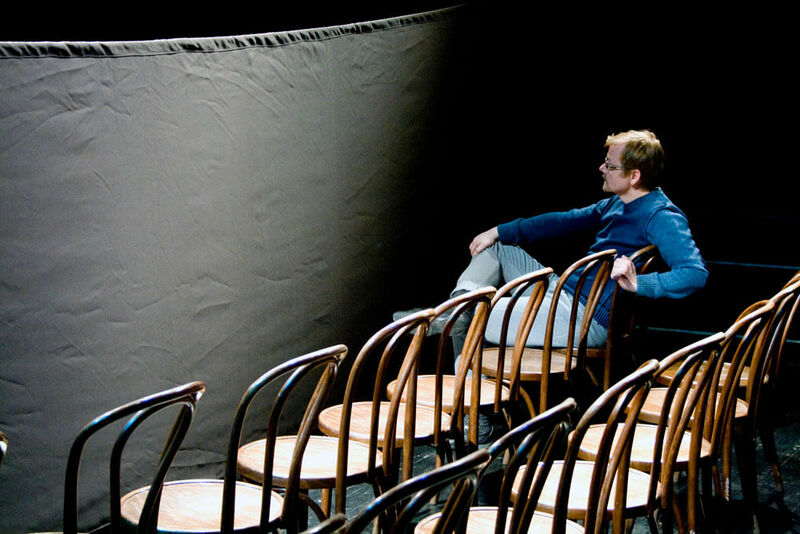 Tim Crouch in 2009 wrote and directed the play The Author, which tells about an incestuous relationship between a father and his daughter. However the play does not focus on the relationship between the father and the daughter but mainly on how the actors had to deal with representing and embodying violence. The monologues that the actors shared with the audience about the process of performing this terrible story, monologues that acquired a status of play within the play, were bubbles, suspensions interrupting the main narration and offered another narrative: the making of the show, which usually remains hidden. In my research I furthered the last notion by claiming that the introduction of a play inside the main play, or frame play, participates in the process of postponing the arrival of the limits. The inside story disrupts, suspends the main story and pushes its limits further. And what is presented here is not only a human in front of other humans, but theatre itself; it is therefore the uncanny experience of the theatre (the being of theatre) that is unfolded. Theatre fractures itself from within and allows its complex nature to be unfolded. And this “unfolding”, this suspension is not a secondary effect, but it is the pivotal action; it is the medium (theatre) allowing the unfolding of the medium’s complexity (in this case: allowing the density of the theatre event to be “outspread”). By borrowing Derrida’s term of arrivant, it would be possible to speak about the play within the play as entrant: the theatre event prepares its own entrance. Similarly to a fictional character entering on the stage; in the space created by the entrant, theatre itself enters! Once I was at the Venice Art Biennale and I saw an elderly woman crossing the room and opening a door in a rush. She was probably looking for a restroom, but instead of the toilet door, she opened the staff door. Behind the door, there was a man who was calmly drinking. Before the man could notice her, the elderly woman closed the door and said jokingly to her friend: “there is the performance of a man drinking!” Humorously, she placed the man onto the performance level. Similarly, as I witnessed her action, I could have said that she made the performance of opening a door and commenting on what she saw. By extension, someone else could have said that I made the performance of witnessing the actions of the woman. And so on. In this case, the Venice Art Biennale was the main “frame” which shifted my mindset, and also the elderly woman’s, and made us perceive everything with different eyes. The performativity of the “drinking man”, the action of the woman, my own “action” of observing, all of them emerged as a performance, as an inside play because the main frame permitted this arrival, this “entrant”. Therefore the frame allowed a gesture to become theatrical. Correspondingly, if I apply this notion to the play within the play, this implies that whenever an inside play is performed the main story becomes the frame allowing the inside the story to enter: the theatre event becomes the frame of itself. This last notion implies that the play within the play and its variations reveal themselves to be an important component in this attempt to “exceed” theatre. Through the play within the play, theatre exceeds itself by “entering” on the stage. Ii would be important also to consider the play within the play in the contemporary context. Traditionally, the play within the play is a device tied to the fabrication of illusions. However, recent scholars like Gerhard Fischer and Bernhard Greiner, tried to rehabilitate the play within the play in the contemporary theatre context by stressing its aspect of self-referentiality. It is possible to note nevertheless that this device is still considered by scholars mainly as a literary device. It is primarily understood and analysed as a device embedded in the written text. However, a strong tendency of contemporary theatre challenges the written text, therefore, the “rehabilitation” of such device must not happen inside the written text, but on another level, in the action displayed on the stage. What I suggest therefore is that rather than approaching this device from a literary point of view and building an intricate system of mirrors and stories within stories, the contemporary performances tend instead “to play with the play”. I mean that contemporary theatre uses the text as a source, as an inspiration, as rough material. Drama then becomes “present” (as a reference) without being staged. This establishes a playful relationship and a critical distance between the written text (or the traditional well-made drama) and the theatre event. The notion of ”play” is subtle and carries many meanings: game, representation, display, engage, enjoy, compete, behave, perform, becoming active, etc. Playing carries also the notion of adhering to a set of rules temporarily. As Huizinga points out in his book Homo Ludens, the aim is not the rules themselves but something else, something that stands out from the play. Therefore, to say: to play with the play, is to use the play (the drama, in this case) as a referent, to adhere to its ”rule”, but for something else. And this “something else” in the case of this examination is the dimension of “process”. For instance the performance Worship! (6) by the Finnish company Ny Rampen combined excerpts from several plays by Shakespeare (Hamlet, Romeo and Juliet, Richard III, Macbeth), whose intent was to explore the need to worship something or someone in order to find a reason in life. The most interesting aspect of this production was a box in which a camera was set. The actors could go inside the box (and therefore “escape” from the sight of the spectators) and appear projected on the screen above the stage. These moments of intimacy mimicked reality TV series where participants are supposed to share “true” feelings with TV viewers. Videos and the action on the stage didn’t necessarily connect. The actor inside the box could reflect on her/his actions, feelings and thoughts. Perhaps there were some direct parallels with the action on stage, but this was not crucial. What was more interesting was the juxtaposition of video with the staged action. The tension was not directed anymore towards the unfolding of the plot or the excitement of suspense. The story was relegated to a second level; it was used as the lure of expectation. The actual aim was not to tell the stories of the various plays, but to use them to establish tension, bordering on conflict. Therefore the plays of Shakespeare were not performed in front of the spectators but were used as a reference. But if the aim is not to reach the end of these stories which function according to the traditional scheme where the end fulfils the expectations raised during the drama, it means that something else must be the key element. Therefore, the story with its traditional construction and expectations is present and acknowledged, but not fulfilled. Instead of materializing on the stage, they hover, as reference, over it. The tension is therefore established between the invisible presence of the story and the scenes performed on the stage. The spectators don’t see these stories but they are present in their mind. What is possible to infer, especially from the two last examples, is that the notion of “playfulness” actually brings in an element of disturbance. The Shakespeare’s plays, which were the source materials, were disrupted, left unfinished, changed, or even contaminated. In a traditional setting, the drama is the model out of which the fiction should emerge and be “displayed” on the stage. The actors do their best to embody the drama and materialize it on the stage. In this case, on the contrary, what was displayed was not the drama, but the playing with the drama. The actors were not so much concerned with embodying the characters as best as they could, but were oscillating between being a character and not being a fictional character, between adhering to the plays and not adhering: in order words, they were playing with the material offered by the drama. The play within the play in the contemporary theatre perspective becomes then more a platform permitting to display on the stage the process of escaping the traditional drama. By displaying a second story within the main story, the situation of the spectators watching actors is repeated on the stage. This repetition of the medium points out another problem, which is often disregarded, the position of the spectators. In fact the act of placing actors, who on the stage become spectators, creates a strange situation where the spectators are observing actors acting as spectators (or as observers). Therefore something in the status of the spectators, or in the act of observing, is put at stake. On this issue I pointed out two different hypotheses. In the traditional drama, the duplication of the spectators is a way to avoid the problem of disbelief. The actor-spectator taking for real what is performed is the figure of the gullible character, whose role is to give credit to the fictional world created on the stage. The other model of the duplication of the spectators is to grant a continuation in the drama. The inside play, which, as I said previously, is not meant to finish, is often composed by fragments. The presence of an observer, in the main drama, permits to give a sense of wholeness to these fragments. This is the main argument of my thesis, the play within the play relies on the traditional theatre paradigm (or the theatre dispositif) in order to point out its own limit. And in the case of the spectator, its status is contested within the “traditional” performer-spectator relationship. And in the context of contemporary theatre, where often the drama is “present” without being staged, which results in performances based on fragments, the actor-spectator is called without being embodied. The task of the actor-spectator, which is to provide a sense of wholeness, is then fulfilled by the audience, who becomes a “double” spectator. From this last consideration, I suggest that maybe the debate raised by post-dramatic theatre is not so much about the drama itself, but rather about the relationship between actors and spectators. In transforming this relationship, the position of the spectator is problematized; this obviously results in a change in the experience of the show and thus in how a story is told. The play Hamletmachine by Heiner Muller (1977), which is considered the paradigm of postmodern drama, abandons the linear plot and deconstructs the play as a whole entity. It presents four monologues, two by Hamlet and two by Ophelia and a short dialogue between the two characters. The monologues and the dialogue don’t have an apparent logical connection. The first line of the play is: “I was Hamlet”. Through this simple sentence Heiner Muller manages to establish a superstructure holding his “fragmented” play. “I was Hamlet”, what does that mean? Is the actor embodying the dead soul of Hamlet? Or has he just performed the Shakespearian Hamlet and now the situation is after that performance in his dressing room? Or does it mean that the character of Hamlet, drawn into the ambivalence but still with the possibility of a choice is gone? In all cases, this sentence immediately establishes a strong link with the Shakespearian text. The play of Heiner Muller places itself inside the world of Shakespeare. It becomes an inside play, whose frame story stands outside the boundaries Hamletmachine. The actor directs the focus of the audience towards a ghost that is invisible but strongly present. The play of Hamlet is so well known that it doesn’t need to be re-performed in order to create the frame story that would allow the inside story to be presented, it is enough to mention it. The invisible presence of Hamlet, which is projected in the head of the spectators, is then the “observer” supporting the fragmentary play. The play by Heiner Muller, even though it refuses the traditional wholeness as a drama, resonates with the “wholeness” while rejecting it. And it is the spectator, with its double status of being spectator and the “actor-spectator”, who grants the “wholeness” to the fragmented play. Before I further this notion of “disruption” and of break, I would like to call Juha and ask him to help me with my presentation. This last sentence has haunted me since. Juha snaps rhythmically his fingers, then stops, stands up, look at the empty chair, look at the audience and then takes back his place and continue the action. I asked, Davide, what is the point of this? Davide: I replied: Daniel Paul Schreber, in the beginning of the 20th century while he was hospitalized in a clinic, wrote a book about his insanity. Indeed the book is a book of a mad man, however by publishing the book Schreber transformed the problem in a radical way: by enclosing his subjection towards the delirium with the “external” point of view of a writer, he changed the perception of his situation. If he would have had the same discourse towards his delirium as a subject, he would have lost himself, but by observing it from the outside (as a writer), there is nothing crazy about it. This change of position, from subject to object, allowed Schreber to project his insanity somewhere away at an “observable” distance. Juha: Is this a metaphor for theatre? That we project something outside of us, something that is too hard to deal with? And then we observe the projection? Davide encouraged me to ask open questions to the audience, because it summons the audience to think about it. A curtain is raised dividing the audience from the Opponents, the Custos and Davide. Juha is sitting on the side of the audience. The dialogue between Davide and Juha will continue even though nobody can see on the other side of the curtain. Davide: What do you make of this? Juha: Hmm, I don’t know. This reminds me vaguely of Theatre of pure imagination. Juha: Well, nobody knows exactly. On one hand, it is literally what it says: Theatre of pure imagination (not to be confused with theatre of poor imagination, which we have plenty of). It takes place completely in the imagination. On the other hand it is a theoretical concept, a logical end-point of a thought, that theatre really is about imagining. It is partly there all the time, but we can never reach it completely, only approximate it. Davide: And how does it work? Juha: Well, we could try this. We have here two situations on both side of the curtain. We know what is there and they know what is here. On the other side of the curtain there are the two opponents, the Custos (presiding official) and Davide. What happens next, however, is in the realm of possibilities. We don’t know will happen on the other side. Maybe Davide is preparing a private demonstration just for the opponents, and they will examine his work in scrutiny for the last time. Even though this is a public defence, lots of academic decision making takes place behind closed curtains. Maybe he asks them to volunteer in an experiment depicting the dynamics of the ancient Greek chorus. Davide is using written instructions and sign language, so that we don’t hear them. He explains that the experiment is quite simple, yet a bit unorthodox, but it is an essential part of his public defense. He advises the opponents to work in silence, for as long as possible. He hands out masks and instructs them to put them on. They look baffled. Davide is showing them a series of simple movements, a sort of choreography, which they repeat together, while still sitting in their chairs. They start to move in unison, they create a unity, just like the tragic chorus. The choreography is quite suggestive, hypnotic, it is setting them to a mild trance-state. They are also making a very low humming voice. You can’t probably hear it because it is so low. Only some animals, like goats and deer, can register this frequency, so they are in a way contacting the animal side of their existence. The voice is resonating deep in their bodies and makes the trance state stronger. The movements are getting bigger. Probably they are removing their excessive clothing and it is getting hard for them to stay silent. The humming and movement are still keeping them together, like one single organism that is about to explode from it’s own, sustained energy. It is a tragic chorus! And from the ecstatic chorus a man emerges. The protagonist is born. The proto character stepping out from the chorus. He replies to the chorus. He sings. He shouts. The curtain is taken down. Everybody can see again the “other side”. During the presentation, at this moment, many auditors smiled. Nothing had changed in the room, but probably in the mind of auditors, the images evoked by Juha were superimposed on the reality. And possibly the auditors were not seeing anymore the Opponents, the Custos and me in the same way. If we look carefully, the moment of the birth of the proto-character happens at the exact moment when the actor exits the chorus; when he steps out of the continuous movement of the ecstatic dancers, in other words: it happens with the act of stopping. In the action of pausing, we place ourselves outside the incessant flux of life and we can observe it. Would this imply that the theatrical act verges on the act of observing? Contemplating? What should the “actor” observe? Let’s suppose that when Thespis, the proto-character left the dancing chorus, a gap was created among the dancers. I could hypothesize he saw the “absence” inside the chorus. By comparing the actions executed by the chorus with the hole left (the absence of his body in the group), he could as well “see himself” moving with the others and comment on it. Would it be then possible to propose that the ultimate action of the character is to observe himself or herself among the other humans? Am I trying to say that the play within the play is a sort of theatricalization of the emergence of theatre? Or the other way around: that theatre itself is a form of the play within the play? At the end of the research I reached a conclusion that paralleled my own journey. I started this research because I was astonished by the play within the play. In it, I saw a jubilatory glorification of the theatre event, of “theatricality”. From this point of view, my first practical work unconsciously followed this vision. However, while furthering the examination, I realized that the most interesting results or elements were the ones that questioned the very nature of theatre. I became intrigued when theatre was put into “crisis”. In fact my second practical work integrated this idea of “scratching” the limits and made a performance out of it. My attention then shifted from the use of the play within the play as a way of praising theatre to it being a device that challenges theatre itself. Il faut aimer du théâtre sa capacité à sortir de soi. Ce pourquoi le meilleur du théâtre advient toujours par théâtralisation du non-théâtre, par exhibition de ce qui échappe à la théâtralité, donc par la mise en scène de l’impuissance, de la limite, de la forclusion du théâtre, et jamais par sa célébration de soi, de son essence ou de ses atours. We should love theatre for its capacity to exceed itself. This is why, the best theatre happens always by the theatricalization of the non-theatre, by exhibiting what escape to the theatrical and thus by the display of a failure, of a limit. And not by the celebration of itself, of its essence and of its strength (7). 1) This article is basically the transcript of my doctoral public defence: Theatre Enters! The Play within the Play as a Means of Disruption. The examination was on Octobre 23th 2015 at the Theatre Academy of Helsinki. 2) There will be only the script of the perfomance. Naturally, it does not provide the full physicalexperience of the public defence ”interrrupted” by a performance, but hopefully it can give an idea ofwhat has happened. 3) The Invisible Stage was premiered on May 2012 at the Dostoevsky Museum in St. Petersburg, Russia.This lecture performance was developed and performed by Davide Giovanzana and Juha Sääski. 4) In this research I am not entering into the debate about “representation” as “Vorstellung” (creating an image) in contrast with “presentation” as “Darstellung” (presenting in front). I simply use it as a technical term, as a synonym for “show”. 6) The performance was created in 2011 and I saw the premiere the theatre festival Baltic Circle in Helsinki.